Perform susceptibility testing of slow-growing non-tuberculosis mycobacteria isolates with this convenient plate intended for research use only. Perform susceptibility testing of Mycobacterium tuberculosis to anti-tuberculosis drugs with this convenient plate designed for research use only. 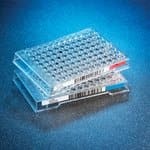 Perform susceptibility testing of rapidly growing non-tuberculosis mycobacteria isolates with this convenient plate intended for research use only.